Vegetables are big food news these days. They’re in the headlines for their delicious flavors, beautiful colors and multiple health benefits. That’s why the US Department of Agriculture’s MyPlate, www.choosemyplate.gov – the graphic representation of the Dietary Guidelines for Americans – gives vegetables a very special place at the table. We are all encouraged to enjoy more than a quarter of our daily food intake from a variety of vegetables – at least 3 to 4 cups per day total for adults and at least 1 to 3 cups per day for children. Unfortunately, very few Americans – young or old – come close to meeting these recommendations. The average daily consumption for adults and teens is only in the range of 1 1/2 to 2 cups of vegetables per day. According to the Dietary Guidelines for Americans, potassium is also a nutrient of concern – because very few of us are getting enough. With 620 milligrams in a medium potato, this white vegetable is a potassium superstar! One serving of potatoes can provide 18% of the DV for potassium – meaning it is an excellent source of this key nutrient. 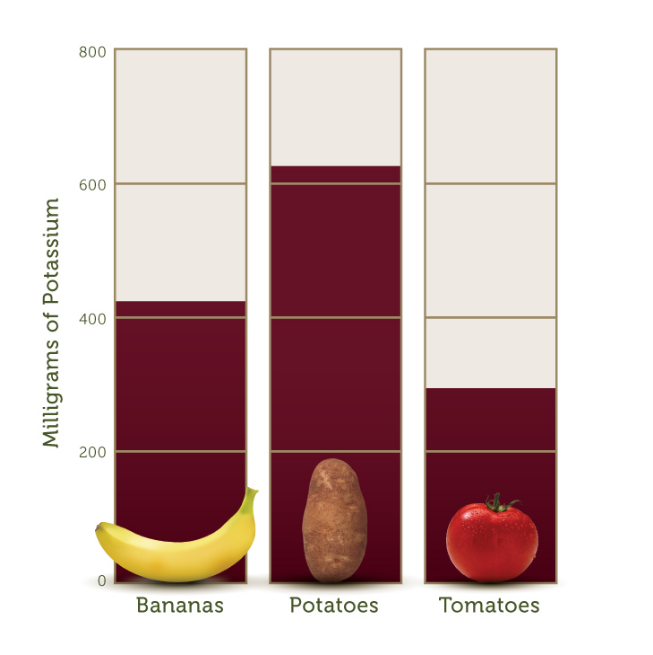 A medium potato has significantly more potassium than a medium banana (420 mgs. ), often touted for its potassium content, and much more per serving than other produce items, including broccoli at 460 mgs. and sweet potatoes at 440 mgs. Most Americans eat only half the recommended amount of daily fiber. This is a nutrient of public health concern and potatoes can help fill that gap. 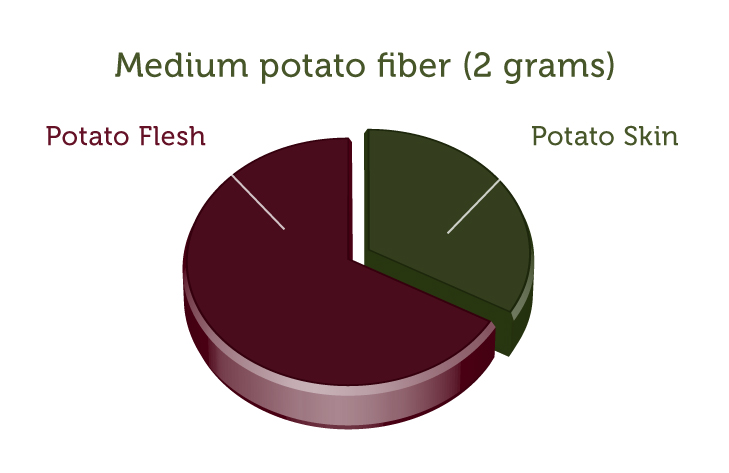 A medium potato with skin has about 2 grams of fiber. Many people think of the skin as the high fiber portion of the potato; however, about two-thirds of the total fiber content is inside, in the delicious flesh of the potato! Supplying 8% of the Daily Value (DV) for fiber, a medium potato has about the same amount of fiber as 1/2 grapefruit or 1 raw carrot and much more than most leafy vegetables. In addition to vitamins and minerals, research documented by Potatoes USA shows potatoes contain an assortment of phytochemicals with antioxidant potential, most notably carotenoids and anthocyanins. 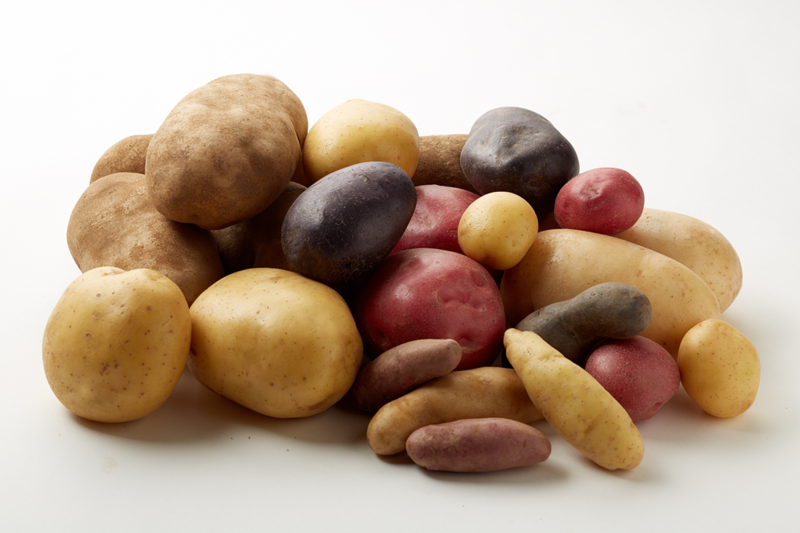 According to Potatoes USA’s Nutritional Handbook, anthocyanins are found in the greatest quantities in purple and red potatoes while carotenoids are found largely in yellow and red potatoes. Also referenced in Potatoes USA’s Nutritional Handbook; a research study examined the total antioxidant capacity of more than 100 different foods including fruits, vegetables, nuts and more. Researchers found that out of the 42 vegetables that were tested, Russet potatoes ranked fifth highest in their total antioxidant levels, coming in behind small red beans, kidney beans, pinto beans and artichokes. However, potatoes scored higher than other vegetables often more commonly known for their antioxidant potential including broccoli, cabbage and tomatoes. 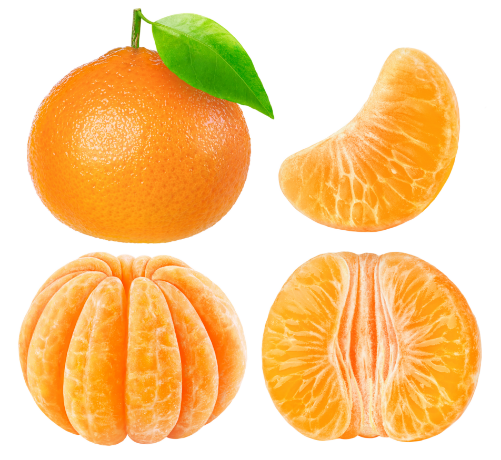 While most Americans get enough vitamin C, it is vital for iron absorption, wound healing and gum health. The vitamin C content of a medium potato is about 27 milligrams – or 45% of the DV, making it an excellent source of this key antioxidant that is also thought to support immune system health. This means that a medium potato has about the same vitamin C as a medium tangerine and a bit more than a medium tomato. It is also a good reason to cook potatoes in their skins, to retain as much vitamin C and other water soluble vitamins as possible. Yes, potatoes have some surprisingly high quality protein. A medium potato has 3 grams of protein, more than most vegetables and about the same amount as 1/3 cup of milk. The quality of the potato protein, including how easy it is to digest and the amino acids it contains, is considered to be high. 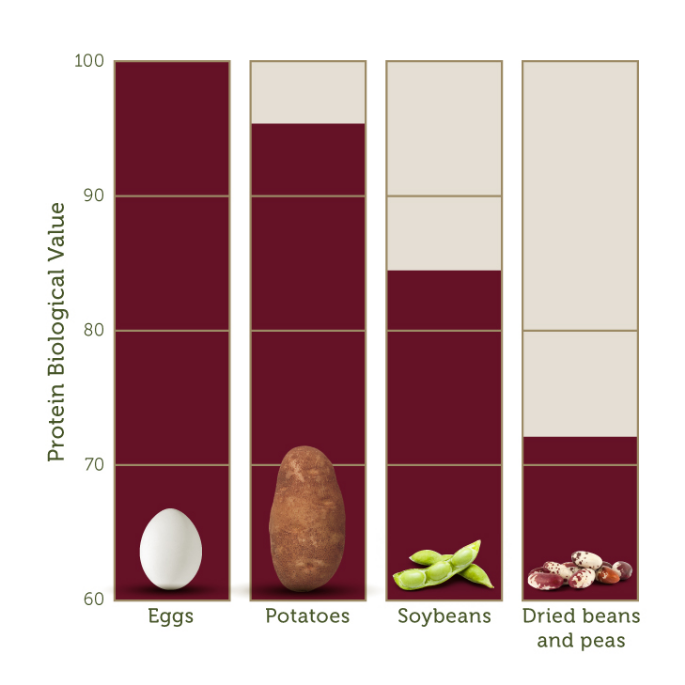 Depending on variety, the biological value for potato protein is between 90 and 100 (the biological value of whole egg protein). This means that potatoes contain essential amino acids in a very similar proportion to that required by humans. In addition to the major nutrients listed above, potatoes also contribute smaller amounts of several other important nutrients, including vitamin B6, thiamin, iron, magnesium and phosphorus. In terms of nutrition, potatoes are also notable for what they do not have. 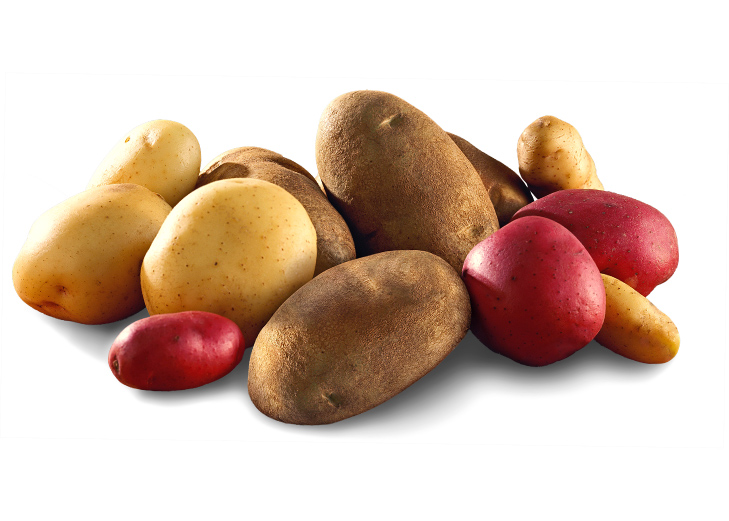 Like most other vegetables of all color, plain baked potatoes have no fat, no saturated fat, no cholesterol and no sodium.